Poblete repeated as the Olympic Conference all-around champion in 2018 and placed in the top-10 in the uneven bars at states for the first time. Felicia Poblete waves after winning the Olympic Conference all-around title for the second consecutive year in October. 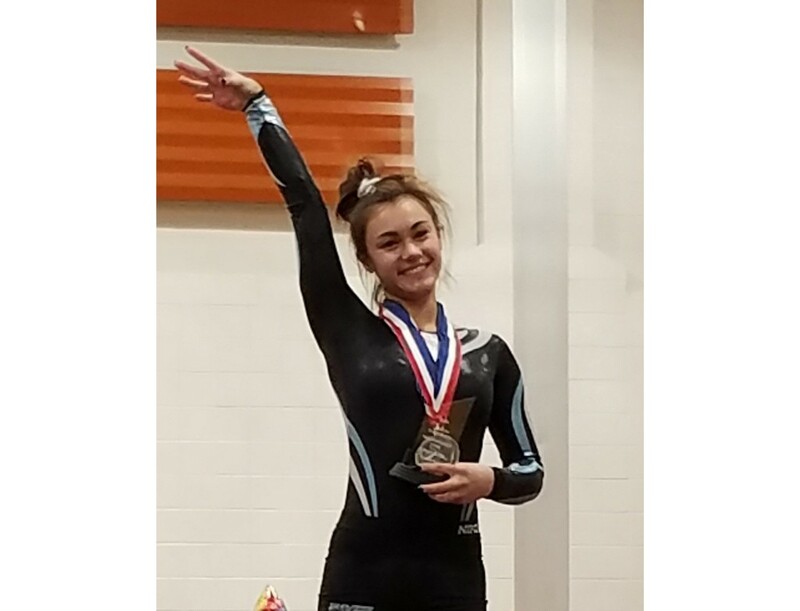 Shawnee High School sophomore Felicia Poblete has put up strong scores in all four events throughout her gymnastics career. However, Poblete admits vault isn’t her strongest apparatus. So when Poblete stepped for her vault attempt at the NJSIAA South Jersey sectional meet on Nov. 3, she never would have thought one of her weaker events would turn into her best score of the day. “I guess it was a good vault day,” Poblete added with a laugh. Poblete won the South Jersey championship in the vault and showcased how much she improved over her freshman year. In 2018, Poblete repeated as the Olympic Conference all-around champion, qualified for the NJSIAA Individual Championships for the second consecutive year and finished top 10 in the state in the uneven bars. Her outstanding high school season makes Poblete the 2018 Sun Newspapers’ Gymnast of the Year. Poblete’s scores across all four events in the 2018 high school season showed marked improvement over 2017. That trend followed an outstanding 2018 season for Poblete with her competitive team, TNT Elite. Last spring, Poblete placed fourth in the all-around at the 2018 New Jersey Level 9 State Championships. Her performance included a first-place finish in the uneven bars, Poblete’s best event. After her strong performance at state’s last year, Poblete is preparing to move up to level 10 gymnastics for the 2019 season, the highest level of gymnastics prior to a gymnast reaching the Junior Olympic Elite level. With the move up to level 10, Poblete began working on a number of new skills over the summer. Some of these new skills were put into practice during the 2018 high school season. Poblete’s best score in the high school season came in the Olympic Conference Championships. In 2017, Poblete tallied a score of 37 in the all-around, her highest score of the season. This year, Poblete topped that with a new high score of 37.45. Poblete finished first in the vault and uneven bars and second in the balance beam and floor exercise. Her performance was a preview of what she would do in the Nov. 3 South Jersey sectional meet, where Poblete placed third in the all-around to qualify for states. On Nov. 10 at the NJSIAA Individual Gymnastics Championships, Poblete’s strongest apparatus allowed her to place in the top-10 of an event for the first time. Poblete finished tied for seventh place in the uneven bars with a score of 9.3, a little less than four-tenths of a point behind the uneven bars state champion, Ariyana Agarwala of Bishop Ahr High School. Uneven bars is a big focus this year for Poblete, who is hoping to compete in gymnastics in college. She is working on adding new elements to her routine for 2019. Poblete described competing in high school as a less stressful experience than competing with TNT Elite. She loves competing for Shawnee, enjoys cheering on her teammates in meets and said the high school season is the perfect place for her to work on some of her skills. Poblete said competing at level 10 gymnastics will be a challenge this winter and spring, but she’s confident she’ll continue to keep improving her routines. As for competing with Shawnee, Poblete said she is looking forward to two more years of high school gymnastics and is hoping to win the Olympic Conference all-around title four consecutive years.